Today’s post is a bit different than my normal posts. I wanted to share some of the tools and gadgets I use in my everyday crafting that are well worth the cost. There is nothing wo rse than getting to the end of a project where you decide to add ribbon and it starts to fray ruining your project! Well no more – there is a really cool product from We R Memory Keepers called the ribbon cutter which does exactly what it says. It cuts ribbon with a hot wire which seers the edges and prevents fraying – a total life saver! Another tool made by Xyron that I reach for all of the time is the adhesive eraser. If you have ev er used wet glue and then touched your project with sticky fingers…. you know it leaves a mark. This little eraser works so well at picking up unwanted glue from your projects and saving you from having to start all over. This is a definite no brainer! This last “tool” is something you would not expect to see – it’s a pen! There is nothing worse than working on a project and getting to the end a nd noticing small mistakes – and it always happens. 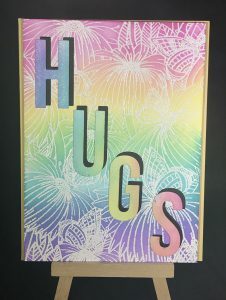 I find if I am using colored embossing powder on a white card, or if I am stamping, stray dots always appear no matter how careful I am. My trick is to use a Uni-ball white gel pen to cover it up. Just take a tiny dot from the pen and hide the mistake. Don’t color – just dot with the pen. It is probably so tiny only you would know it was there to begin with, but this is the perfect way to cover it up. I hope you enjoyed these tips – I will post a few more soon but I thought this was a great start! Let me know if you have favorite tools you use when crafting too! Happy Crafting!